Learn Something New Today and Implement It Tomorrow! I am so excited to let you know about the launch of a new collection of books created by Apple Distinguished Educators. Last year, I participated in my first ADE Institute, held in Austin Texas. At the institute, the idea was introduced to us, to write a lesson, or a chapter on something that we felt was "One Best Thing" that we could share with other educators. "The One Best Thing is a collection of books, created by Apple Distinguished Educators (ADEs), that demonstrate the use of Apple technologies to transform teaching and learning. 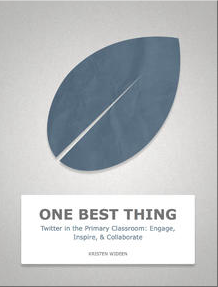 Each One Best Thing book shares a unit, a lesson, or a best practice and is designed to help another educator implement a successful practice. It’s a professional learning idea championed by an educator—in word and action—that others can look to for ideas and tips on how to replicate." There are 102 books that were chosen altogether from approximately 500 submissions. These books are short so you can read them quickly, (in a night) and be able to implement right away. There are books about assessment to photography and everything in between. Here is the direct link for you to check out all the amazing content. Don't forget to check my book out, on Twitter in the Primary Classroom. I would love to hear your feedback!